A zero percent balance transfer offer sounds like a great opportunity to enjoy a few months with no credit card interest. You can move your balance from your current credit card, where you might be paying high finance charges each month, to a credit card where you'll pay no finance charge for six months or more. Before you jump at the opportunity, consider the pros and cons of doing a balance transfer. It may not be as cut and dry as you assume. Let's look at a few of the benefits of taking a balance transfer offer. You can take advantage of a lower credit card interest rate, which is especially beneficial if you currently have a high interest rate on the credit card balance you're considering moving. Transferring a balance to a credit card with a lower interest rate will give you a chance to make a bigger dent in your credit card balance. Since you'll have a lower interest rate and possibly no finances charges, more of your monthly payment will go toward reducing your credit card balance, instead of towards interest. You may even be able to pay off your balance completely by the time the promotional period ends. You can move your balance to a credit card with better terms. If your current credit card has bad terms – high fees or a short grace period, for example – you can move your balance to a better credit card and close out your old credit card account for good. The new credit card may even offer credit card rewards on your new purchases. You can consolidate your credit card debt, leaving yourself with fewer credit card payments to make each month. Moving multiple credit card balances to a single credit card (given it has a high enough credit limit) can eliminate the hassle of making multiple credit card payments to several different credit cards. It’s easier to pay off one credit card balance than it is to pay off several. Of course, we have to also consider the potential downside of transferring a balance to a new credit card, even with a balance transfer offer. You could end up with a higher interest rate if you don't qualify for a promotional interest rate. Not everyone qualifies for the promotional interest rate. You typically must have an excellent credit score to get a low interest rate balance transfer offer. Otherwise, you’ll only qualify for the regular (higher) balance transfer interest rate. Balance transfers can get expensive considering the balance transfer fee and the annual fee if the new credit card has one. Before you transfer the balance, make sure you factor in the full cost of moving your balance and compared to the interest you would pay if you left your balance on your old credit card. Leaving your balance on the old credit card may cost less in the long run. A balance transfer could hurt your credit score. Applying for and opening a new credit card account can affect your credit score. Not only that, your credit score takes a hit anytime you have a credit card with a balance that’s above 30% of the credit limit. If you move your credit card balance to a credit card that doesn’t have enough available credit, your credit score could drop. The good news is that you can recover lost points by reducing your balance with timely credit card payments each month. You're at risk of more debt. Once you transfer your balance to a new credit card, you suddenly have more credit available to you. You have to be disciplined enough not to make purchases on your old credit card. Otherwise, you'll end up with more debt than you started out with. Close your old credit card if you need to remove the temptation to rack up more credit card debt. 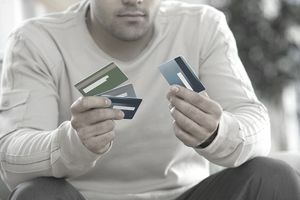 While there are some drawbacks to transferring your balance to a new credit card, consider how transferring the balance will affect your finances in the long-term. If you will ultimately save money and pay off your credit card balance faster, then transferring the balance is worth it.